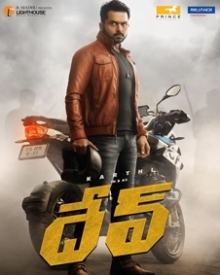 Dev (2019) Dev(Karthi) is a fun and adventure loving guy who forcefully gets in touch with Meghana(Rakul Preet), a rich business woman who has no time for love. At first, Meghana avoids Dev but slowly falls for him. The twist in the tale arises when Dev starts having issues with Meghana and her possessive attitude. Rest of the story is as to how Dev and Meghana dealt their differences and get back together..
karhi and rakul combo get a another romantic love story ,this time pure romantic and love feel in it, in movie dev was an adventure and rakul was a busniess women and one day dev saw the meghana and how ever they meet in very strange feel and how ever its an nice story ,general aduience give good marks ,in some areas ,but movie cant get hit talk . dev movie released in this feb 14th lovers day,all though it was an pure love and romantic entertainer ,audience are wait and watch it ,but as per audience view its an boring story and they got no emotional and fell love in it,rouitn story so audince get bored and karthi get a another flop movie . karhi and rakul was back with romantic love stroy,dev ,here movie was an cute love romantic story ,rakul was a busniess mind girl and dev was a adventure guy and he had an ambition to climb mount everest and in between meghana rakul and fall in love ,and how they meet and how they are in love ,what are the problems they get ,is the movie ,music is good and screenplay is nice . DEV karthi was back with in action and this time he comes with an romantic love entertainer ,and how ever its an nice movie ,director creates a world and natural problems was happen in lovers and all its an nice love story rakul was nice acting and ramykrishna was back with this movie so all over movie get a good talk . a romantic love story from kathi and rakul ,coming to stroy karthi as dev and rakul as meghana ,dev was traveller and adventure guy and meghana was a complete a business women and how ever this two meet and love each other how they feel comfort and they got some disturbances all finally they will together in climax ,so watch on the deater . Dev' Is A Wafer-thin Story That Gets Its Story-telling All Wrong. The Conflict Is Ineffective And The Way..
Karthi Has Tried Hard To Lift The Movie With His Charm But The Boring Drama Doesn’t Allow Him To Succeed..
Is This Adventure Film Or Romantic Drama? Even Though The Protagonist Loves Adventure, The Movie Hardly..
Karthi Is Portrayed As A Youngster In The Movie. But If We Keep His Adventurous Scenes In The Movie Aside &..
Dev Is Easily One Of The Most Boring Movies In Recent Times.Hero Characterization Is Unclear With Half Baked..
We Fail To Understand Why A Hero Like Karthi Accepted The Project. There Is Nothing Called Story And Plot It.. Even The Himalayan Trek In The Climax Doesn't Engage Due To Poor VFX And Unimaginative Direction. The Ending..
On The Whole, Dev Is A Disappointing Romantic Drama Which Fails To Click. It Is Hard To Understand How Karthi..
DEV Movie | Karthi & Rakul Preet..